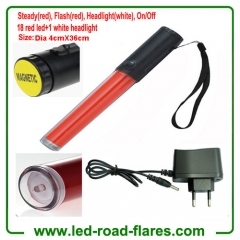 The Rechargeable Led Traffic Baton provides highly visible traffic safety light for guidance to pedestrians or drivers.This 36cm rechargeable led traffic baton with built-in rechargeable battery can flash or shine in red, providing a highly visible lighting to help direct traffic or to give an alert. 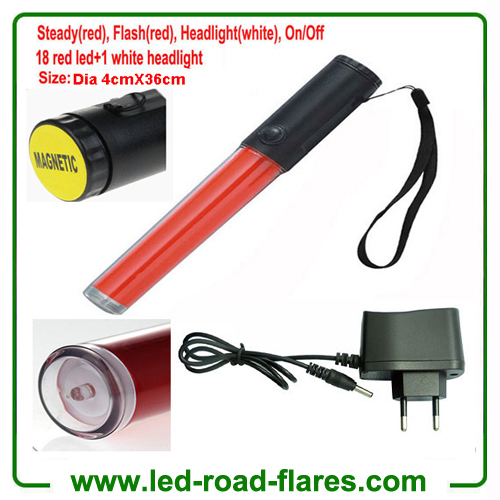 The Traffic Baton also features a handy torch(white headlight) and a magnetic base. 1. Outer tube: impact-resistant and durable PC tube. 2. Built-in super bright reflective lattice film. 3. Tie with lanyard and hung on the waist for easy carrying. 4. The bottom is with an magnet . 5. Waterproof design, it can still work in the rain. 6. Push the button to change the flashing model.